St. Paul artist Carl Bohnen (1872–1951) was an accomplished pencil-and-charcoal portrait artist. In 1914 a group of local, wealthy arts patrons underwrote the cost of sending Bohnen and his family to Germany so that he could study painting in oil. Shortly after the family settled in Munich, they found themselves stranded in a country that was at war with France and Great Britain. Despite the hardships and privations the Bohnens subsequently experienced, they coped and Carl was able to study and get occasional commissions. 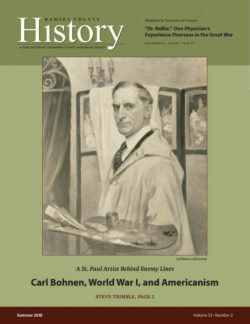 After the United States declared war on Germany in April 1917, Bohnen sought to leave Germany. Eventually the Bohnens were able to make their way to St. Paul in the summer of 1917, where they found themselves under suspicion for having been in Germany and for not being as pro-American as many in St. Paul demanded of their fellow citizens. Nellie N. Barsness (1873–1966) was the first woman from the state of Minnesota to graduate from the University of Minnesota’s medical school (1902). She then set up her practice St. Paul. After the United States declared war on Germany, Dr. Barsness sought to join the army’s Medical Reserve Corps or the American Red Cross. Neither organization would take female doctors; consequently in September 1918 she volunteered for service in the French Army via the Women’s Overseas Hospital U.S.A. She soon found herself treating patients of all kinds on the Western Front, many of whom were suffering from the effects of gas warfare. Following the Armistice in November, Dr. Barsness helped treat ailing patients in Nancy and Rheims. In September 1919, Dr. Barsness returned to St. Paul, resumed her medical practice, and was active in the community. Today her unselfish service is honored at the University with a medical scholarship for women. Established in 1870, the Minnesota Boat Club holds the distinction of being the first formal athletic association in the state. The Club soon wrestled with the question of the difference between a professional and an amateur rower. Initially it accepted the idea that an amateur rower’s livelihood was such that it prevented the individual from full-time training. This definition was compatible with their associated ideals of upright citizenship and superior social standing, In 1885, however, a seemingly harmless incident challenged this notion of amateur and when in 1895 the Club’s rowers had to compete against oarsmen from Canadian clubs whose livelihoods were based on farming, logging, and the like, the Club revised its definition of amateur to exclude anyone who earned a living by manual labor. Today’s rowers are all amateurs and the beauty of the sport is its own reward.